Difficult times lie ahead for Adam Keefe as he tries to inspire his team back to the sparkling form which opened the season. Form that seems a long way away from that which suffered a 5-3 defeat to the hands of the Dundee Stars in the DIA. 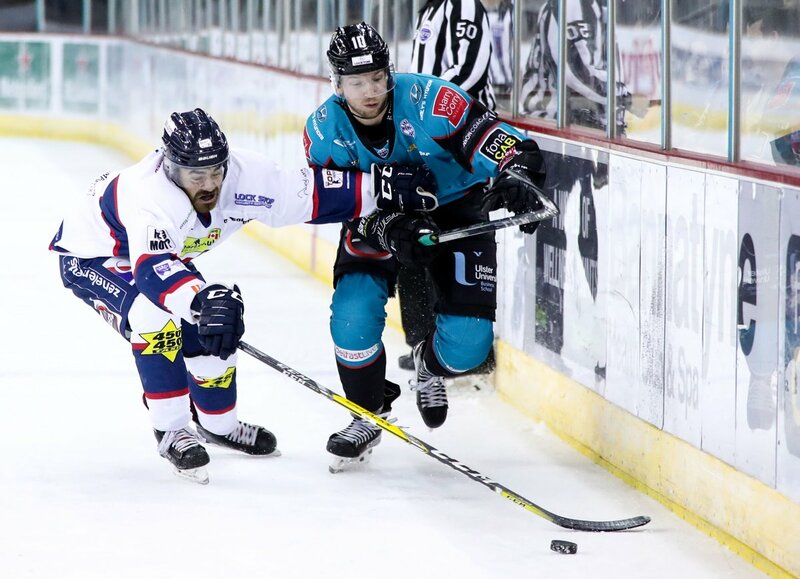 Despite the win in the SSE Arena, the Giants needed to show more bite or they would no doubt suffer the consequences. And the opening exchanges certainly belonged to the visitors. Patrick Dwyer tipping in a shot from McFaull, the goal went to review and was given, but incorrectly announced as Swindlehurst in the arena. Giants leading 1-0 after only three and half minutes. Four minutes later, Francis Beauvillier doubled the advantage and gave Giants control of the game, his first goal as a Giant putting more confidence in the attack. Yet that confidence was not translating to defence, Goals from Mike Sullivan and Jordan Cownie, 2 minutes apart were more down to loose defending that exposed Tyler Beskorowany without protection. It looked like the 1st period was to end 2-2, but Patrick Dwyer had different ideas. A wonderful buzzer beater of a finish past Sjogren, timed at 20:00, gave the Giants the advantage once more as the period came to a close. That was to be last goal from the visiting side. An inability to clear up the rebound of a great Beskorowany save allowed Francois Bouchard to level proceedings on the powerplay. And Lukas Neilson, also on the powerplay, would put the home side ahead for the first time in the game as the second came to a close. Once again the Giants looked flat. Unable to unlock Sjogren and struggling to find tape in passing. A frustrating time that was compounded by untidy work in defence that would put Beskorowany under undue pressure. And that pressure was to tell as in the 3rd the Stars would strengthen their advantage, Neilson with his second of the game, the Giants having fought off a 5 on 3, but still with 4 men. Beskorowany was pulled with nearly 2 mins on the clock, Connor Cox in the box for delay of game, allowed the Giants to try the 6 on 4 attack, but to no avail. A well deserved home win for the Stars just rewards after 2 hard-fought performances. The Giants, however, continue with their hardships. 1 win in 5 games, only 2 points in EIHL competition. And while it is early in what will be a long long season, Adam Keefe and Steve Thornton must look at their team and consider where improvements need made. Most certainly defencive frailties are a concern. But looking to the forward lines and their inability to unlock Sjogren in the same means that Owen confounded them last week is either an unwelcome co-incidence, or a real focus in preparing for MK’s visit next weekend.